Having covered the orthodox approach to half guard, today I moved on to the knee shield, position also commonly known as z-guard. Using your knee, you can make it more difficult for your partner to move forwards against your half guard. It's also handy for creating distance, as well as nullifying the whizzer. If you use the leverage from your knee to square up your upper body by leaning back, that should help avoid the control they can generate with a whizzer. For knee positioning, one option is to put it right on their hip, which means you can keep your feet locked. However, that also means you knee is quite low, so there is the disadvantage that they may be able to shove your knee to the mat and pass, particularly if you have the knee right across to the opposite hip (on the same side hip, there should be less danger). To enhance your control, you can try Xande's approach of coming up on your elbow while also stiff-arming into their shoulder (sort of like sitting guard). Another option comes from Jason Scully, who likes to get a tight overhook from that position. 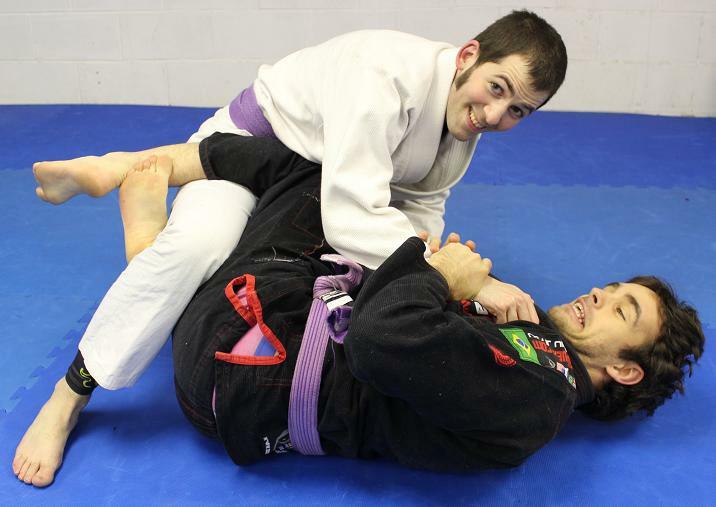 To stop that, you could put your knee up high into their chest, like Caio Terra. As ever, there are pros and cons, as putting your knee up high may open up a gap between your feet. If you leave a gap between your feet, it is possible your partner may then be able to simply circle their lower leg around and free themselves. So, if you can't cross your feet, then clamp them together, to create a barrier to that leg-circling. Alternatively, clamp them onto your partner's leg, again to make sure there isn't a gap. Whichever position you go for, the ability to control the distance means that one good option from the knee shield is recovering your full guard. Push with your controlling knee to square up your body, then pull out the other leg. You can often get that in transition, as your opponent tries to move around your knee. But be careful, as if they can crush down onto your leg, that can stuff your guard recovery. It's therefore important to prevent them from bringing their weight down, either using your knee (like Caio Terra), your stiff arm (like Xande) or the overhook (like Jason Scully). Teaching Notes: It's been a while since I've taught half guard and even longer since I went through the knee shield. I'm still working out the best structure, but tonight went relatively well. I could cut down on the amount of variations, though I think it's worth going through Xande, Scully and Terra's approach, as that can be shown without going into too intense detail. I could potentially have added in taking the back, but I'll leave that for Wednesday, I think. I might put in the scissor sweep too. During the mini open mat afterwards, Rafal shared a useful escape he learned at SBG Dublin, in regards to the arm triangle. I don't often get put there and I rarely use that submission myself, so my options from it are pretty basic. The SBG Dublin escape involves 'corkscrewing' out of the arm triangle, turning in and then away to free yourself.